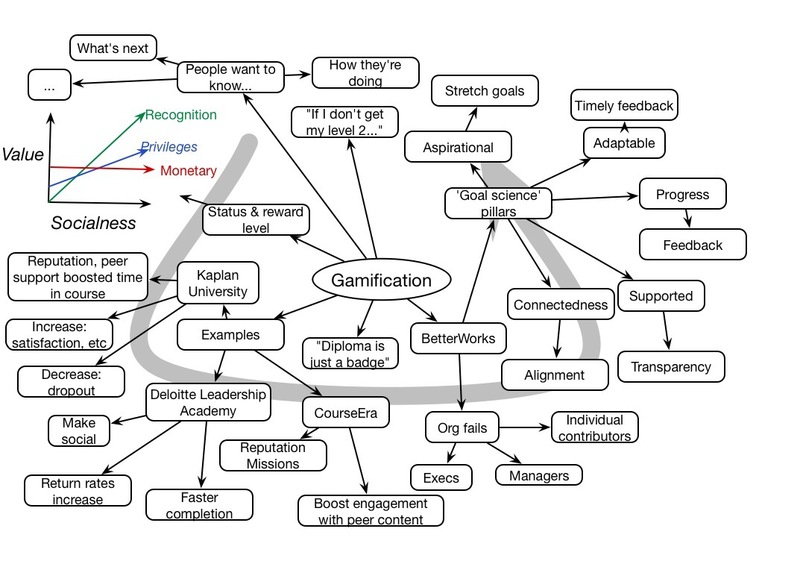 Kris Duggan spoke on gamification at the Bay Area Learning Design & Technology MeetUp. He talked about some successes at his Badging role and then his new initiative bringing gamification more intrinsically into organizations. He proposed five Goal Science rules that resonated with other principles I’ve heard for good organizations. This is a name you’re not likely to know, but I can’t let his passing go without comment. Joe was an intensely private person who had a sizable impact on the field of technology in learning, and I was privileged to know him. I met Joe when my colleague Jim “Sky” Schuyler, who had hired for my first job out of college, subsequently dragged me back from overseas to work for him at a new company: Knowledge Universe Interactive Studios (KUIS). I’d stayed in touch with Sky over the years, and I was looking to come back at the same time he had been hired to lead KUIS’s work to be an ISP for the KU companies, but also to create a common platform. I was brought on board to lead the latter initiative. To make a long story short, initially I reported to Sky, but ultimately he moved on and I began to report to the CEO, Joe, directly. Sky had said that he liked working for people smarter than himself, and if indeed Joe was such this was quite the proposition, as Sky was not only a Northwestern PhD but a wise colleague in many ways. He’d been a mentor and friend as well as a colleague, and if Sky (reticent as he is) thought highly of Joe, this was high praise indeed. I got to know Joe slowly. He was quite reserved not only personally but professionally, but he did share his thinking. It quickly became clear that not only did he have the engineering chops of a true techy, he also had the strategic insight of an visionary executive. What I learned more slowly was that he was not just a natural leader, but a man with impeccable integrity and values. I found out that he’d been involved with Plato via his first job at Battelle, and was suitably inspired to start a company supporting Plato. He moved to the Bay Area to join Atari, and subsequently was involved with Koala Technologies, which created early PC (e.g. Apple) peripherals. His trajectory subsequently covered gaming as well as core technology, eventually ending up at Sega before he convinced the KU folks to let him head up KUIS. He seemed to know everyone. More importantly, he had the vision to understand system and infrastructure, and barriers to same. He was excited about Plato as a new capability for learning. He supported systems at Koala for new interface devices. He worked to get Sega to recognize the new landscape. In so many ways he worked behind the scenes to enable new experiences, but he was never at the forefront of the public explanation, preferring to make things happen at the back end (despite the fact that he was an engaging speaker: tall, resonant voice, and compelling charisma). In my short time to get to know him, he shared his vision on a learning system that respected who learners were, and let me shape a team that could (and did) deliver on that vision. He fought to give us the space and the resources, and asked the tough questions to make sure we were focused. We got a working version up and running before the 2001 crash. He continued to have an impact, leading some of the major initiatives of Linden Labs as they went open source and met some challenging technical issues while negotiating cultural change to take down barriers. He ended up at SportVision, where he was beginning to help them understand they were not about information, but insight. Unfortunately, I didn’t have much view into what was happening there, as it was proprietary and Joe was, as I said, private. Joe served as a mentor for me. I found him to have deep values, and under his austere exterior he exemplified values of humanity and compassion. I was truly grateful when I could continue to meet him regularly and learn from him as he expressed true interest as well as sharing his insights. He was taken from us too early, and too quickly. He fought a tough battle at the end, but at least was surrounded by the love of his life and their children as they passed. Rest in Peace. Update: there’s a memorial site for Joe, http://www.josephbmilleriii.com where you can leave thoughts, view pictures, and more. RIP. Last week’s #lrnchat (a twitter chat on learning that runs Thurs evenings for an hour 5:30 PT/8:30 ET) was on the topic of fear-mongering in Organizational Learning. The point is that often fear-mongering happens (by definition always wrongly), but what are the reasons, impacts, and ways to avoid. And among my responses are one that I like as a quip. I was, in particular, flashing back on the book Story Wars, that talked about how advertising has changed. This was in the context of fear-mongering as an approach to motivating behavior. In that book, they cited how advertisements in older days were designed to target your concerns. In essence, they made you worry about shortcomings as a motivation to buy remedies, whether to address your personal hygiene or appearance of success. What’s changed is that they’ve now moved on to finding out that what is more motivating is tapping into your goals. What are you trying to achieve? Who are you and what reflects your passions? Then they provide products that can align with your self-image. Of course, their ability to target your market segment is much more advanced, so they know more about who you are and have more specific means of reaching you. In learning, however, this is also true. It’s far better to tap into your aspirations to motivate your learning than drumming on your fears. The latter will work some, if you’ve got legitimate concerns (e.g. losing your job), but far better is to help you understand how this will help you. In thinking through how to design courses that lead to both engaging experiences and meaningful outcomes, I’ve been working on the component activities. As part of that, I’ve been looking at elements such as pedagogy in pre-, in-, and post-class sessions so that there are principled reasons behind the design. So, here I’m looking at trying for guidance to align what happens in all three sections. In this case, two major types of activities have emerged: more procedural activities, such as using equipment appropriately; and more conceptual activities such as making the right decisions of what to say and do. These aren’t clearly discriminated, but it’s a coarse description. Of course, there’s an introduction that both emotionally and cognitively prepares the learner for the coming learning experience. 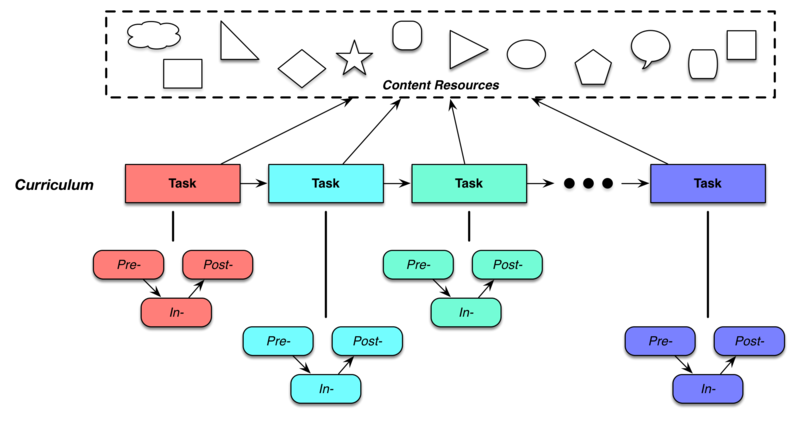 So for conceptual tasks, what we’re looking to do is drive learning to content. In typical approaches, you’d be presenting conceptual information (e.g. ‘click to see more‘) and maybe asking quiz questions. Here, I’m looking to make the task of processing the information to generate something, whether a document, presentation, or whatever, and that the processing is close to the way the information will be used. So they might create a guide for decisions (e.g. a decision tree), or a checklist, or something that requires them to use the information. (And if the information doesn’t support doing, it’s probably not necessary.) As support, in a recent conversation I heard that interviewed organizations said that making better decisions were the keys to better job performance. Whereas in the procedural approach, we really want to give them practice in the task. It may be scaffolded, e.g. simplified, but it’s the same practice that they’ll need to be able to perform after the learning experience. Ideally, they’ll have to explore and use content resources to figure out how to do it appropriate, in a guided exploration sense, rather than just be given the steps. …for in-class learning, the learners should be reflecting on their performances, and the instructor should be facilitating that at the beginning, using the information about what’s working (and not). Then there should be additional activities that the learners engage in that require them interacting with the material, processing (conceptual) or applying (procedural) it with each other and then with facilitated reflection. Finally, the learners after class should be getting given elaborative activities. In the case of the conceptual task, coming up with an elaborated version or some additional element that helps cement the learning would be valuable. The practice or activity should get fleshed out to the point where the learner will be capable of appropriately acting after the learning experience, owing to sufficient practice and appropriate decontextualization. The goal is for retention over time and transfer to all appropriate situations. A while ago, I argued for an activity-based curriculum. The point was to rebel against the usual content-based curriculum, and push us to more meaningful learning. And, of late, I’ve had a chance to reexamine both the curriculum ideas, and the pedagogical implications. So I’ve been in a situation where I’ve been handed a curriculum already developed, and the content is already being fleshed out. In trying to move beyond good, albeit traditional, elearning, I’ve been working hard on the notion of what a meaningful activity (read: practice, task, etc) would be. As context, we’re working here within a pre-class, in-class, and post-class model. As a consequence, I’m pushing an alternative to what would be content presentation pre-class, practice and group discussion in-class, and simulation and summary assessment as post-class. While this is not too far from traditional blended learning, I’m also trying to get better alignment with what learners will be doing after the learning experience with sufficient practice. So for each module, I’m looking for a meaningful practice. For even a knowledge based task, I’m asking learners to develop something that requires them to integrate the knowledge, not just present and test. And revisit the knowledge several times. So, for example, if learners are looking at types of hacking attacks, I ask them to create a defense plan as a pre-class task. They’ll get a chance to self-evaluate, and instructor feedback, before generating a second attempt. In many ways, it doesn’t matter what they create as long as they’re making a suitably sincere effort, it’s the processing that matters. A colleague asked whether this meant that they’d always generate a product of learning, and my preliminary answer was yes, and then I realized that there was another way to view it. It could also be the trace of the learner in a simulation, but in some sense that’s a product as well. The important point is to have learners perform and create an output of that performance as a manifestation of their thinking. It’s not taking knowledge tests (if it absolutely has to be known cold ‘in the head’, you’ve got the excuse for a tarted-up drill-and-kill, but make sure it absolutely does), but processing information in meaningful ways. In-class, they’ll still be doing practice and reflection, but they should be processing and/or practicing. For example, discussing and comparing the guides, and maybe then an activity that refreshes their knowledge of the attacks. The team came up with a game that has one side giving hints about an attack, and the other side trying to guess it. After class, it’s more elaborated practice. For instance, they might be implementing their defenses in a sim, or refining their attacks, or… The activities need to reinforce and build, reactivating and reapplying the knowledge in ways that mimic how it will be used in the performance context so that practice is both meaningful and spaced. I’m still working within the existing paradigm, but the work I’m inspired by is the work of Roger Schank and his team at Socratic Arts, where they’re rethinking the curriculum more comprehensively, where they get the subject matter experts (SMEs) to sit down and come up with a series of activities that are the curriculum. This is what I intended, but at this point I’m still working within an already underway curriculum. Even this small change will be better learning, and we will get to the curriculum as well ;). I’ll shortly be on the road going both near and far. And it occurred to me that the distance isn’t the issue so much (aside from the time zone) as is the adaptations you face. I’ll suggest it’s the change that you must adapt to as much as the time. Sure, first of all, there’re the time differences. On short jaunts, the direction matters too. I (selfishly) don’t have a lot of sympathy for East Coast US folks who have to come here to the West Coast. I find it easier to stay up later and get up later (well, I don’t really get up later, I’m a bad sleeper, brother got all the good sleeper genes) than to try to go to bed earlier (as if) or get up earlier. (I’ve gotten my doctor to assist with the ‘going to bed earlier!). Of course, at the end Easterners will have to go back, but that brings up a second issue. I think it’s much easier to adapt when you’re in a familiar context. It’s easier for me to get back to schedule at home than to adjust to a different time zone in an unfamiliar environment. There’re the regular rhythms of life at home that give you many more cues than just the clock about what’s happening. Kid’s schedules, meals, etc. Which makes one of my strategies for travel to give myself food cues. And that difference magnifies. I find it more exhausting overall to deal with new contexts, and that diminishes your available resources for other coping. So it’s harder to cope somewhere else than at home, and in a more similar culture than a more unfamiliar one. I would find it easier, for example, to go to Germany (where my Mother was born) or the UK than somewhere a similar distance away (maybe Spain or France) but more foreign to my experience. And Europe is easier than the MidEast, which in general is more different. Saudi Arabia, for instance, though a fascinating place, was quite challenging to figure out how to cope. And despite being quite far, Australia is easy for me because I lived there for a number of years (and the culture isn’t that different regardless). Business makes it a bit easier, too. As a somewhat common culture, you can moderate the differences in expectation. Dress and hours won’t vary too much, but there are subtle differences in discussions and negotiations. Hofstede’s dimensions help illustrate how countries can differ. Though even organizations can have different cultures that may need to be navigated. And this all affects some more than others. Some people are naturally relaxed and confident, and if it’s coupled with being good sleepers, they’ll be fine. Others of us fret more about having things go trouble free (and I find as I get older that this is becoming more frequently the case :). And, of course, the importance of the outcome can influence the degree of confidence and comfort or not. So I invest effort in trying to get things right (and recently relearned the lesson from being too relaxed about it). So food cues, striking the balance between bringing the right stuff and traveling light, getting outside, and caffeine have been my tricks. Also reading up on new places to have some advance notice. Books and movies too, for the travel time itself (again, not a good sleeper). Does this make sense to you? How do you cope? Having found a fun site of bad UX design, someone else followed me who had the UX Drinking Game site. And it made me think maybe we need an LX Drinking Game. So I started tweeting out some drinking game rules. I encourage you to join in with the hashtag #LXDrinkingGame. So, what other rules do we need? Tweets (again, #LXDrinkingGame) or comments welcome ;).